The No. 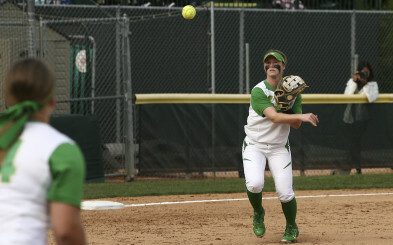 1 Oregon Ducks (49-6) are knocking on the Women’s College World Series door. Following a series sweep at the Eugene Regionals last weekend, the Ducks advance to the Eugene Super Regionals to face NC State (38-20) in a best-of-three series at Howe Field. The winner advances to the first round of the eight-team WCWS in Oklahoma City. The No. 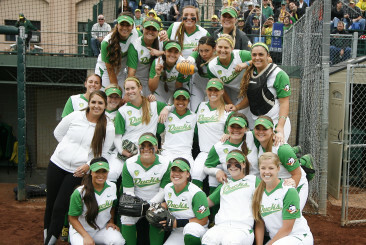 2 seeded Ducks are favorites over NC State at the Eugene Super Regionals. Throughout the regular season and beyond, the three-time Pac-12 Champions have dominated their opponents in every phase of the game. However, the unranked Wolfpack remain slightly more mysterious, especially after completing a three-game sweep at the Harrisonburg Regionals last week. FishDuck.com takes a quick look at the NC State softball program and how the Wolfpack stack up against the top-rated Ducks. 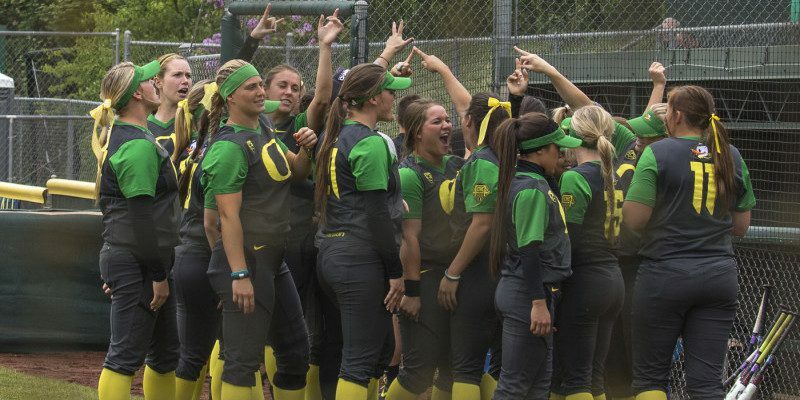 This weekend, Oregon makes its sixth-straight Super Regional appearance and remains a perfect 18-0 in its NCAA regional playoff games under Oregon head coach Mike White. 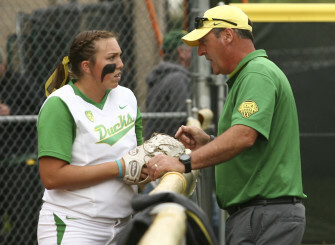 The two-time Pac-12 Coach of the Year‘s reputation precedes him as a two-time International Softball Federation (ISF) World Champion with the New Zealand Black Sox national team (1984, 1996). Coach Mike White talks to his ace, Cheridan Hawkins. White was named International Softball Congress (ISC) all-World player 10 times, Most Valuable Pitcher twice (1987, 2002) and his 70 tournament wins are the most in ISC history. White also led four different teams to the ISC World Championships (1987, 1992, 2000 and 2002). The cherry on the trifle came in ’96, when he pitched a perfect game in the Black Sox’ 4-0 shutout of Canada, giving the Kiwis their second ISF world crown. While this is NC State’s first Super Regional, they are also led by a world champion: Head Coach Shawn Rychcik. Rychcik is in his third season with the Wolfpack and has earned softball’s highest marks throughout his career. He played for Team USA in the ISC. And to top that off, Rychcik holds five ISC world championships, two Amateur Softball Association (ASA) national championships, a handful of Olympic medals, and two U.S. Olympic Committee’s men’s fast-pitch Player of the Year awards (1999, 2000). After White received his American citizenship, the Kiwi star pitcher joined Rychcik on Team USA. They each earned a bronze medal in 2000. Rychcik has succeeded as a coach as well. He is a three-time America East Coach of the Year, leading the Boston University Terriers to consecutive league championships (2009, 2010) and two NCAA tournament appearances. At NC State, Rychcik’s Wolfpack teams continue to surpass the university’s historical milestones. In 2014, the Wolfpack broke a school record with a 14-game win streak, posted the fewest losses in school history and became the first North Carolina school to advance to a regional final undefeated. The 2015 season marks NC State’s first Super Regional appearance. The Ducks’ offensive production is nothing short of luxuriant. In national rankings, Oregon is third in batting average (.366) and on-base percentage (.467), sixth in the nation in slugging percentage (.614) and eighth in runs scored (7.6 runs per game). The Ducks lead the Pac-12 in stolen bases (88) and triples (13, tied with Cal and UCLA). Oregon bats have brought heavy lumber all season, tying the school record with 80 home runs on the season, including eight grand slams. These heavyweight numbers have helped the Ducks to an eye-popping 20 run-rule victories this season. Janie Takeda’s record breaking senior season isn’t over yet. For NC State, seniors Renada Davis and pitcher Emily Weiman are having an incredible final season for the Wolfpack. Davis received 2015 All-Southeast Region second team honors, leading her team with 66 hits and .382 batting average. The senior slugger is a threat to score or break a game open at any time and has been essential to the Wolfpack’s attack. In the circle, Weiman made the 2015 All-Southeast Region third team and has a 2.41 ERA. The ace leads the ACC and is 10th in the nation with 294 strikeouts this season, and has accumulated more than 1,000 strikeouts in her career. Weiman has pitched 10 shutouts and holds the NC State record for most career wins. Freshman Jenna Lilley was named Pac-12 Freshman of the Year. These statistics might be reason enough to cause alarm for the Ducks, but Oregon is loaded with players of this caliber throughout their lineup, as well. Oregon’s junior pitcher and two-time Pac-12 Pitcher of the Year, Cheridan Hawkins, recently made the final cut for the USA Softball Player of the Year award. The lefty holds an astonishing 1.40 ERA and 249 strikeouts. On offense, Oregon is led by senior Janie Takeda, who is having a record-breaking final season with the Ducks. Takeda now owns four school career records, including most hits, most runs scored, most stolen bases and most doubles. The Ducks have talent in their youngsters, as well. Freshman Jenna Lilley made a huge impact in her playing debut as Pac-12 Freshman of the Year, earning All Pac-12 first team honors. Lilley has a .441 batting average and is a two-time NFCA Player of the Week. All in all, the Ducks have eight All-Pacific Region selections, including Takeda, Lilley, Hawkins, Hailey Decker, Janelle Lindvall and Geri Ann Glasco. So, this Super Regional series is a bit of a mismatch across the board. If the Ducks execute in every phase — pitching, hitting and fielding — Oregon should have no trouble overpowering the Wolfpack’s lack of depth at hitting and in the bullpen. If there is one thing to know about NC State, it’s that they have nothing to lose. Coach Rychcik has taken this program to impressive new heights. They are a team that can’t be overlooked and have fought hard to get where they are. However, the Ducks determination to win it all will ultimately trump the Cinderella story of the Wolfpack.